Twin Lens Reflex cameras are cameras that have a pair of coupled lenses (meaning that focusing one also will also focus the other): one used solely for composition via a mirror and one used solely for taking the photo itself. There are certain box cameras like the Ansco Anscoflex that are commonly referred to as “pseudo TLRs” because, despite their superficial resemblance, their lenses are neither coupled or focusable. There is evidence to suggest that the first twin lens reflex camera was a custom-made one-off built by the British optical manufacturing firm R & J Beck for an employee of London’s Kew Observatory (now known as the King’s Observatory) circa 1880. About five years later, TLRs became commercially available but these early models were so bulky and awkward that the concept never really caught on until decades later when two men named Paul Franke and Reinhold Heidecke took the reigns. After founding the firm Franke & Heidecke (now better known as Rollei) in 1920, the duo’s first product was a stereo camera named the Heidoscop which had a third lens in the middle connected to a waist-level viewfinder. Seven years later, a prototype was constructed by essentially removing one of the Heidoscop’s outer lenses and rotating the viewfinder 90 degrees. By 1929, the very first Rolleiflex came off the production line to resurrect and totally revolutionize the TLR. 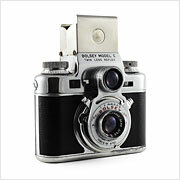 With its new brilliantly compact form factor, the Rolleiflex became the template for a new generation of twin lens reflex cameras and within five years, German rivals such as the Zeiss Ikon Ikoflex and the Voigtländer Superb began to surface. 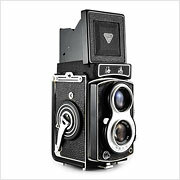 By the time the popularity of twin lens reflex cameras began to wane in the 1980s, TLRs had been manufactured all over the world including China’s Seagull, Japan’s Mamiyaflex, the French S.E.M. 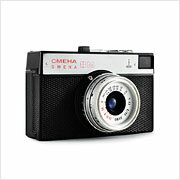 Semflex, the Czech Meopta Flexaret, the Soviet GOMZ/LOMO Lubitel, Poland’s WZFO Start, and the American Kodak Reflex. 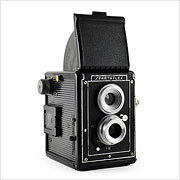 Not all twin lens reflex cameras were designed with the Rolleiflex layout in mind, however. 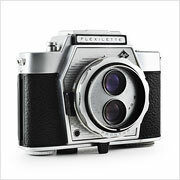 Several 35mm TLRs were produced such as the Bolsey Model C and the Agfa Flexilette. Other unconventional TLRs include the Welta Perfekta folding camera, the diminutive Goerz Minicord, and the Concava Tessina spy camera. Interested in starting or growing your own collection of twin lens reflex cameras? McKeown, James M. and Joan C. McKeown’s Price Guide to Antique and Classic Cameras, 2001-2002. (Grantsburg, USA: Centennial Photo Service, 2001), 352, 447-448, 456, 579, 607-608, 661, 699, 720. Holmes, Edward. An Age of Cameras. (Hertfordshire, UK: Fountain Press Argus Books Ltd., 1974), 75, 78.